James Brown Miller (October 25, 1861 – April 19, 1909), also known as "Killin' Jim", "Killer Miller" and "Deacon Jim", was an American outlaw and professional killer of the American Old West, said to have killed 12 people during gunfights – perhaps the most known homicides by one man of his era. Miller was referred to by the alias "Deacon Jim" by some because he regularly attended the Methodist Church, and he did not smoke or drink. He was lynched in Ada, Oklahoma, in 1909 along with three other men, by a mob of residents angry that he had assassinated a former deputy U.S. marshal. Miller was married to a daughter of a cousin of John Wesley Hardin, another notable Old West outlaw. Miller was born in Van Buren, Arkansas, but his parents migrated to Franklin, Texas when he was one year old, and he grew up there. His father Jacob Miller, born in Pennsylvania in 1801, was a stonemason, and helped build the first capitol building in Austin. Miller's mother was born Cynthia Basham. Just a few years after the move, Miller's father died, so the mother took their children and went to Evant, Texas to live with her parents. In 1869 when Miller was eight, his grandparents were found murdered in their home. Miller was arrested, but was not prosecuted for the crime. His sister, Georgia, and her husband, John Thomas Coop, accepted the boy onto their farm at Plum Creek near Gatesville. The 1880 census records him as being nineteen years old, living in Coryell County, Texas, with his siblings and widowed mother. On July 30, 1884, Miller shot his brother-in-law (with whom he had an argument) with a shotgun while the latter was sleeping on his porch. Miller was arrested for the murder, convicted, and sentenced to life in prison; however, the conviction was overturned on a technicality. After leaving the Coop farm, Miller became a hired hand on the McCulloch County ranch of Emanuel "Mannen" Clements, cousin of outlaw John Wesley Hardin. Clements was killed by Ballinger City Marshal Joe Townsend on March 29, 1887, during the period when Miller worked at the ranch. Townsend was later ambushed by an assailant wielding a shotgun, which became known as Miller's signature style, and severely wounded in one arm. Townsend survived, but lost his arm to amputation. 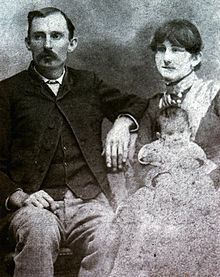 Miller and his family, c. 1890s. Over the next couple of years, Miller traveled the Texas–Mexico border region and operated a saloon in San Saba County. In Reeves County, Miller became a deputy sheriff and later town marshal in Pecos. During this time, he gained a reputation for killing Mexicans, claiming that they had been attempting to escape. In 1891 Miller married Sallie Clements, daughter of Mannen Clements. Assuming the appearance of a devout Methodist, he would earn the nickname Deacon Jim. He was well liked by the townspeople because he was polite and an avid member of the church. Regardless of the weather, he was known to wear a long, black frock coat. Miller became involved in a feud with Pecos Sheriff George A. "Bud" Frazer. 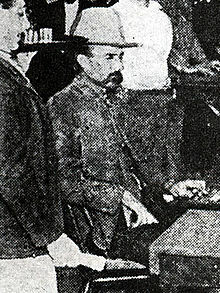 While Frazer was on a trip to El Paso, he was informed that Miller had allowed criminals to gain greater control over Pecos. Frazer enlisted the help of Texas Ranger John R. Hughes to secure Pecos. After returning to Pecos, Frazer immediately jailed Miller on a charge of murder. A jury acquitted him of this charge. Frazer believed that Miller had stolen mules and had him arrested for theft. 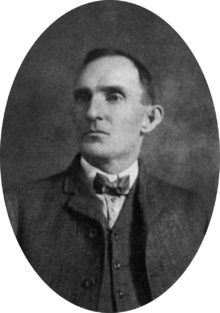 On April 12, 1894, in Pecos, Miller was confronted by Frazer about his involvement in the murder of cattleman Con Gibson. Frazer did not wait for Miller to go for his shotgun, and shot and wounded him in the right arm. While Miller was attempting to fire his gun with his left hand, hitting bystander Joe Krans, Frazer fired again, hitting Miller in the groin, which finally put him down. Frazer emptied his six-shooter into Miller's chest. After Miller's friends had rushed him to a doctor, his frock coat was removed to reveal a large steel plate that Miller wore under it as a kind of bulletproof vest; it saved his life. Miller recovered. On December 26, 1894, Miller was standing outside of a blacksmith's shop when Frazer began to fire at him. Frazer hit Miller in the arm and leg. Rushing in to finish him off, Frazer tried to shoot Miller in the chest, but the metal plate in Miller's coat saved him again. Frazer, demoralized, quickly retreated. Miller had Frazer charged with attempted murder. The case was heard in El Paso, and ended in a hung jury. Frazer lost his bid for reelection as sheriff and left town for Eddy, New Mexico (now Carlsbad). A few months later, he returned to the Pecos area to visit his mother and sister. Miller learned Frazer was in the area. On September 13, 1896, Frazer was at a gambling table in Toyah, Texas. Miller opened the saloon's swinging doors, levelling his shotgun on one of them. He shot Frazer, who was dealing, removing most of his head. Frazer's sister confronted Miller, who threatened to kill her as well. A jury acquitted Miller. Miller muttered threats toward Joe Earp, a witness who testified against him. Three weeks after Miller's trial, Earp was killed by a shotgun blast. To secure an alibi, Miller spent the night riding his horse on a grueling 100 mi (160 km) journey. The prosecuting district attorney, Judge Stanley, later died of food poisoning in Memphis, Texas. Despite his legal issues, Miller joined the Texas Rangers, and worked as a resident ranger in Memphis, Texas. Later he served in Hall County. At that time, he killed a man in the neighboring county of Collingsworth in the course of his work. Miller moved his family to Fort Worth in 1900, where his wife Sallie opened a boarding house, aided by their older children. Here Miller began to advertise as a professional killer, charging $150 for each murder. Miller killed two men near Midland that year and was arrested for the murder of one of them. Miller's partner on the trip, Lawrence Angel, was convinced to take credit for the killing. Acting as a witness, Miller claimed that Angel acted in self-defense. During the summer of 1902, Miller claimed that he caught three men stealing cattle in Ward County. He killed two of them using his Winchester, and wounded the third, who escaped by managing to cling to his horse and ride away. Miller killed lawyer James Jarrott on August 28, 1902. Jarrott had defended area farmers near Lubbock who were raising fences against cattle; ranchers took them to court, believing that the fences disrupted the grazing of their cattle . Those ranchers hired Miller to murder Jarrott, paying $500. Miller caught Jarrot while watering his horses near his farm. Miller had to shoot Jarrot four times: "He was the hardest damn man to kill I ever tackled." In 1904, Miller took a contract for the murder of Frank Fore. On March 10, Miller followed his target to the Westbrook hotel, even as Fore was accompanied by three other lawmen: Dee Harkey, Jinx Clark, and Tom Coggins. Miller left the trio in the lobby and shot Fore in a restroom upstairs. Immediately afterward, Miller attempted to surrender to Harkey, but the latter refused to participate. Clark and Coggins would later claim that they witnessed the shooting and that Miller acted in self-defense. Fore died on March 13. On August 1, 1906, Miller killed Ben C. Collins, a lawman for the Bureau of Indian Affairs in what was still Indian Territory. (Oklahoma was admitted as a state in 1907.) It was retribution ordered by a man named Port Pruitt, whom Collins had shot and crippled in 1903 when Pruitt resisted arrest. Pruitt had already hired another gunman for $500, but the gunman took a $200 advance, told Collins of the threat, and left the territory. Miller was reportedly paid $2,000 for that murder, which he carried out in front of Collins' home and his wife. Miller shot Collins with a load of buckshot. Collins returned six shots, but was hit in the face by Miller and died. Miller was arrested for the murder, but was not convicted and eventually released. On February 28, 1908, Pat Garrett, ex-lawman and killer of Billy The Kid, was killed near Las Cruces, New Mexico, ostensibly because of a land dispute. Miller was alleged to have committed the murder and to have been paid to do so. Historians believe this is unlikely, as Jesse Wayne Brazel confessed to the crime. Brazel was tried and acquitted on the grounds of self-defense. Carl Adamson, who was married to a cousin of Miller's wife, was with Garrett when he was killed. This may have contributed to rumors of Miller being involved in the murder. Historians still disagree over the facts of Garrett's murder, but the consensus is that it was committed without Miller. 'Killer' Jim Miller, far left, wearing black hat, hangs from a livery stable rafter after lynching in Ada, Oklahoma, 1909. The others are Allen, Burrell and West. Miller was contracted by local ranchers Jesse West and Joe Allen, through middleman Berry B. Burell (there is disagreement over the spelling of the man's surname), for the murder of Allen Augustus "Gus" Bobbitt of Ada, Oklahoma, a cattle rancher and former Deputy U.S. Marshal. The murder was alleged to have been ordered either to acquire his land or because of a personal grudge. The fee was $1,700. On February 27, 1909, Miller chose a place of ambush, concealing himself near Bobbitt's ranch house. Bobbitt and his hired man Bob Ferguson arrived from town by their supply wagons. Miller shot Bobbitt in the side with both barrels from his shotgun. Bobbitt tumbled out of the lead wagon, and Miller left the scene on his way to Fort Worth, passing by Ferguson. Bobbitt's wife dashed out to check on her injured husband. Before dying, Bobbitt confirmed that he had been attacked by Miller. The murder was also witnessed by Oscar Peeler, a 19-year-old cowhand who had accepted $50 to lead Miller to Bobbitt. Miller was arrested in Texas by a Texas Ranger and extradited to Oklahoma to stand trial alongside Jesse West, Joe Allen, and Berry Burrell. The evidence against the four suspects, however, was not considered strong, leaving open the chance for acquittal. Many Ada residents knew that weeks earlier, a man named Stephenson, a suspect in the murder of Town Marshal Rudolph Cathey in Pauls Valley, Oklahoma, on November 3, 1907, had been acquitted on murder charges. A lynch mob, reported by The Daily Ardmoreite as numbering 200 and by Associated Press as "estimated from 30 to 40 in number", broke into the jail "between two and three o'clock" on the morning of April 19, 1909. They dragged the four suspects outside to an abandoned livery stable behind the jail. Miller remained stoic while the other three reportedly begged for their lives. Miller made two final requests: that his diamond ring be given to his wife and that he be permitted to wear his black hat while being hanged. Both requests were granted. He also asked to die in his black frock coat; this request was denied. Miller is reported to have shouted, "Let 'er rip!" and stepped voluntarily off his box to hang. The bodies of all four men were left hanging for several hours, until a photographer could be brought in to record the moment. These photos were sold to tourists in Ada for many years. ^ a b c d e f g h i j k l m n o p q r s O'Neal, Billplop (1979). Encyclopedia of Western Gunfighters. University of Oklahoma Press. pp. 230–233. ISBN 0-8061-1508-4. ^ a b c d e f g h i j k l Metz, Leon Claire (2003). The Encyclopedia of Lawmen, Outlaws, and Gunfighters. Checkmark Books. pp. 172–173. ISBN 0-8160-4543-7. ^ "James Jarrott". Legislative Reference Library of Texas. Retrieved 2012-10-04. ^ "Frank Fore". The Daily Ardmoreite. March 11, 1904. p. 1. Retrieved 2012-10-04. ^ "Frank Fore Dead". The Daily Ardmoreite. March 14, 1904. p. 5. Retrieved 2012-10-04. ^ Bill O'Neal, Encyclopedia of Western Gunfighters, University of Oklahoma Press, 1991, p. 72. ^ See: Bullis, Don (2007) New Mexico; Biographical Dictionary 1540-1980 Rio Grande Books, Los Ranchos de Albuquerque, New Mexico, p. 165, ISBN 978-1-890689-60-5, for a discussion. ^ "Four Men Pay Price of Bobbitt's Death/ Miller, Allen, West and Burrell are Lynched by Mob at Ada this Morning". The Daily Ardmoreite. oklahomahistory.net. April 19, 1909. Retrieved 2012-10-04. ^ Metz, Leon Claire. The Shooters. p. 159. James, Bill (1989). Jim Miller, The Untold Story of a Texas Badman. Henington Publishing Company. Nash, Robert (1994). Encyclopedia of Western Lawmen & Outlaws. Da Capo Press. ISBN 0-306-80591-X. Farris, David A. (2011). Oklahoma Outlaws, Spooky Stories and all around folklore. Little Bruce. ISBN 0-9646922-4-4. The story of Jim Miller is recounted in the song "You Can't Kill Jim Miller," by Rick Adams and John Neal. This page was last edited on 24 November 2018, at 06:18 (UTC).